I’m so happy summer is finally here. The warm weather, beach days and afternoons spent lounging by the pool is my favorite time of year. If only I had a pool boy and gardener to do all those chores outside, it would be absolute perfection. But I don’t mind doing yard work and cleaning the pool, because that I means I’m getting exercise for the day, and a little sun too! And when it gets just too hot outside, I come inside for my favorite refreshing snack, some watermelon. During the summer, I buy at least 1 watermelon every week. We not only snack on watermelon slices, but we also make frescas, grill watermelon and add watermelon to salads and salsas. This watermelon is one of my favorites. It’s super simple, cool and refreshing with a nice little spicy kick. 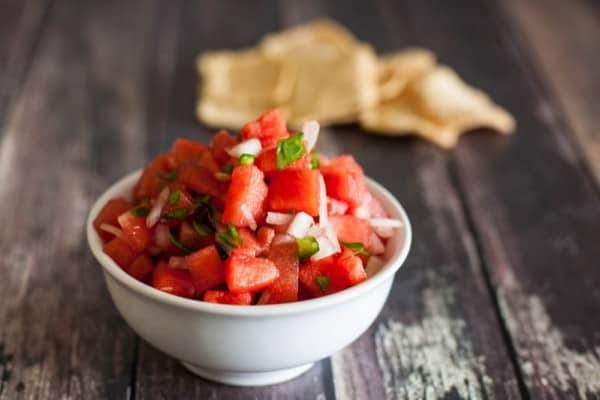 To dip this amazing watermelon salsa, I use my favorite snack, Wheat Thins Popped Chips. These little bites of joy are my new Ultimate Snack. 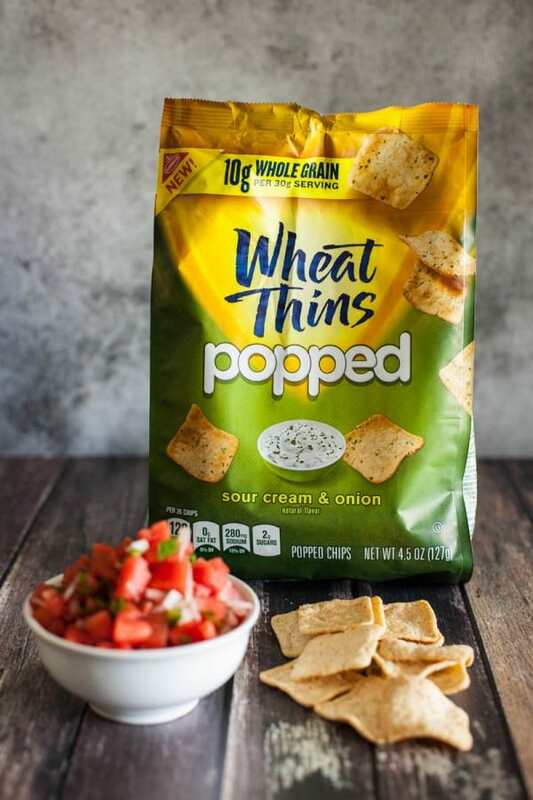 Because they’re popped, you get the same satisfaction that you get eating a potato chip, but because they’re Wheat Thins, they’re a mindful snack option. Wheat Thins Popped Chips is a wholesome snack that fits easily into my new wholesome eating plan. Wheat Thins Popped Chips are just 130 calories per 26 chips, which makes them a great snack option. What Thins Popped are my new must have ultimate snack. I love that they contain 10 – 11g of whole grains per serving, and their satisfying crunch. My husband and son both love that they’re a poppable and munchable snack, perfect anytime of the day. You can find Wheat Thins Popped Chips in the cracker aisle of your local grocery store. Combine all ingredients in a large bowl and mix well to combine. Disclosure: This post was sponsored by Wheat Thins Popped through their partnership with POPSUGAR Select. While I was compensated to write a post about Wheat Thins Popped, all opinions are my own. I love this idea Angie, so perfect for summer!! Turning any fruit to salsa is welcome in my book. This watermelon version is no exception! I haven’t seen these Wheat Thins Popped Chips but I’m definitely going to be on the look out for them! I’ve always loved Wheat Thins so I’m sure these will become a favorite. Love that watermelon salsa, too. Yum! I love wheat thins! I can’t wait to try this new variety. I love the idea of putting sweet fruits with savory ingredients. 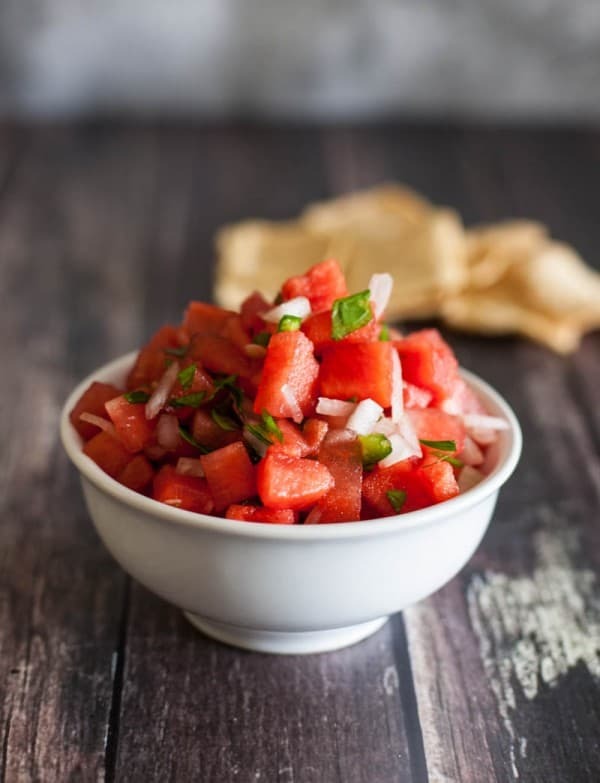 Watermelon salsa is definitely something I’d get on board with! I’m a fellow watermelon fiend in the summer. I love the spice in the salsa! 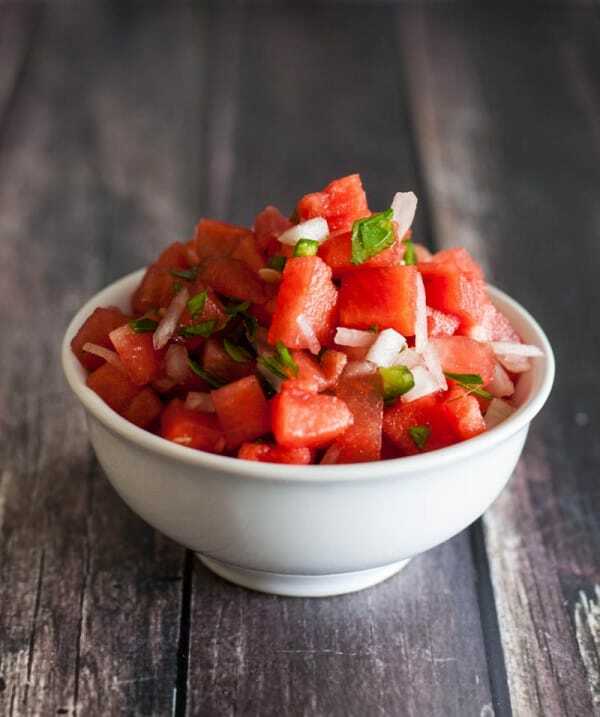 I LOVE this watermelon salsa! It’s perfect for this summer heat! This is so pretty, I love watermelon salsa. This is fabulous, love the photos so very much. I’d be dipping everything in sight into this. Love this! Perfect for summer time! Such a fan of this! The colors look amazing! I made a HUGE bowl of this last weekend for our next door neighbors high school graduation party (2 watermelons worth). I made it REALLY spicy…At the end the kids had a food fight on the patio (the mom actually encouraged it lol) The poor boy who had the bowl of mostly juice poured over his head started screaming “my eyes…my eyes” due to the spiciness! Note to self – never include spice watermelon salsa in a food fight!